The following is part two of an interview with Scott S. Elliott, who is assistant professor in the Philosophy and Religion department at Adrian College, with a specialty in Biblical Studies. His books include, Reconfiguring Mark’s Jesus: Narrative Criticism After Poststructuralism, (2011) Ideology, Culture and Translation, (2012) edited with Roland Boer, and Reinventing Religious Studies: Key Writings in the History of a Discipline, (2013) of which he is the editor. Part one of the interview can be found here. Matt Sheedy: In the second to last section of the book, entitled Religious Studies and Identity Politics, scholars such as Russell McCutcheon, Darlene Juschka and Gustavo Benevides take up the problem of the role of market forces in the 1990s in shaping the perceived value and direction of the human sciences. It may come as a surprise to many younger scholars such as myself who are experiencing the sting of a poor job market that these issues were being raised back then. What are your thoughts on the relevance of these earlier debates in relation to the study of religion today and what they might suggest for possible solutions? Here I am thinking, for example, of Tim Jensen’s essay on how he and his colleagues in Denmark have worked directly with business and government on matters pertaining to religion while at the same time using a deconstructive approach that rejects the idea of religion as sui generis. Scott Elliott: I’m convinced that there is still plenty of work to be done in the field of Religious Studies. Or perhaps I should say that there’s plenty of work to be done by scholars trained in and/or conversant with Religious Studies, regardless of whether or to what extent we’re concerning ourselves with the field as such. Just as the field was undergoing a process of redefinition when these essays were first published, we are in the midst of redefinition again today. Such processes are always long and messy. False starts abound. Territory is difficult to concede, especially when paychecks and job security are at stake. It’s hardly news that the humanities are in crisis. I’m inclined to agree with Alexandra Petri’s piece in The Washington Post (June 26, 2013) that many of the arguments on their behalf aren’t doing them any favors. Admittedly, many in the field of Religious Studies would contest Petri’s reasons for studying the humanities, contending that, in the case of religion, her reasons reflect remnants of the past that the majority of religion scholars have fought so hard to escape. In fact, I know some would even wish to disassociate religious studies from the humanities. Nevertheless, her fundamental point is sound: the case for the humanities (and for the study of religion specifically) should not be market-driven but rather should be made on the grounds that they provide a means both for understanding the discourses by which the world around us operates and for equipping individuals for intellectual self-defense (to steal a phrase from the syllabi of my former professor, Russell McCutcheon). I think students are a key factor. The Council always recognized the importance of students. The national honor society for Religious Studies and theology, Theta Alpha Kappa, held membership in the Council, and one of the Council’s primary publications was the Directory of Departments and Programs in North America. Moreover, as noted in the Introduction, the Bulletin reflected the value that the Council placed on teaching. It’s also striking when one considers the number of folks who were students when they first became involved with the Council or the Bulletin. I edited the Bulletin while a doctoral student, and you yourself are presently pursuing your PhD while editing this blog. Admittedly, the “already/not yet” position that students occupy (if you’ll pardon a somewhat hackneyed phrase from New Testament studies) is unsustainable and leaves them vulnerable. At the same time, however, I think students enjoy a degree of freedom that many are forced to exchange to secure their membership cards, and a different perspective than those who are the establishment. I don’t mean here to idealize students, or to wax nostalgic. I just think that students can and should take advantage of whatever creative impulses they may have. I also think blogs and social media are key factors. The rapid dissemination of ideas, in-the-moment sharing of perspectives, and the eminently public nature of these venues and formats offer something the monographs and lecture halls never will. Granted, they often leave much to be desired (and perhaps even to regret on occasion), and I’ll be the last one to say that we should dispense with certain tried and true genres of scholarly production and dissemination. But I like the way social media can circumvent traditional gatekeepers, and I especially like the potential they have to question, if not altogether blur, the lines between what’s “properly academic” and what’s ordinary (the sacred and profane, as it were). In many respects, I think social media embodies a more robust version, if you will, of what the Council aimed to be in its day. 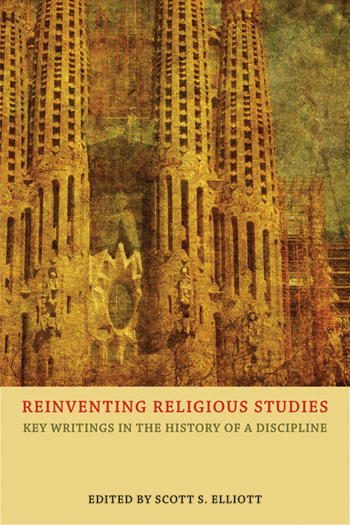 MS: In his article appearing in this volume, “Religious Studies: The Next Vocation,” Jacob Neusner observes that in the 1970s the field was dominated by an interest in ancient religions and guided by a post-Christian syncretism, while also pointing out that contemporary religion and Islam were understudied. One of the things that I found most interesting in Reinventing Religious Studies was the final section dealing with Islam and 9/11. When one searches job postings in Religious Studies today, Islam appears to be one of the more popular areas of study. Is your inclusion of this section on Islam and 9/11 perhaps indicative of how Religious Studies has come of age in the new millennium? Where do you see debates headed today? SE: I’ll admit that when I was editing the volume, I was a bit self-conscious about the fact that it was closing with essays addressing an event that was already a decade in the past, and that I had included in the collection nothing more recent than 2002. Now, the way you’ve put this question has forced me to think again about this issue, and to see it from yet another perspective. September 11, 2001 was certainly a crisis moment for me. I was in Boston at the time, just beginning the third semester of my PhD coursework. All I could think was, “Why on earth am I pursuing a doctorate in Biblical Studies and early Christianity? !” You can take that question at least two ways, but both have to do with relevance. There are pros and cons, I think, to the “popularity” of Islam as an object of study in our field (not to mention in a number of neighboring fields). Increased study of Islam is certainly both good and absolutely necessary, not only to come to terms with history but also to address to the fast-changing present. Islam is in the news every day. Or rather, certain aspects of Islam that intersect with other issues of concern in the “secular” world (e.g., banking practices, free-speech, gender) are regular topics of conversation. We would all, of course, do well to better understand what’s going on here. Religious Studies scholars generally and particularly those who specialize in Islam can help us do that, and all the more so if they’re suitably equipped and well positioned to speak beyond the confines of the academy. On the other hand, however, it reflects a reactive approach, which has frequently been the case in Religious Studies. This isn’t entirely surprising; it’s to be expected, to a point. But how do we get ahead of the curve, so to speak? How might religion scholars, on occasion, be the ones leading the conversation? Unfortunately, I don’t have any satisfactory answers. Nevertheless, one place to start may be to think differently about matters of influence, historical trajectory, antecedents, and so on. In other words, to think not only about religion(s) influence on groups and ideologies that follow afterward chronologically, or about how this or that theory or theorist might help us explain religion, but instead to think about the ways that religion and other discourses (including the academic study of religion) are always mutually implicated, each (re)creating and shaping the other at every turn. In so doing, religion would function less as a concrete and privileged object of study and more as a test case for analyzing more fundamental dynamics of human interaction. MS: Thanks very much for your insights on this new and important book. This entry was posted in Matt Sheedy, Politics and Religion, Religion and Society, Religion and Theory, Theory and Method, Uncategorized and tagged 9/11, Alexandra Petri, Darlene Juschka, Gustavo Benevides, Islam, Jacob Neusner, religious studies, Roland Boer, Russell McCutcheon, Scott S. Elliott, Tim Jensen. Bookmark the permalink.